The Preda urinal ... innovative features. 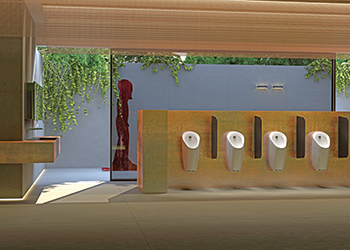 Global sanitary ware producer Geberit has launched its new Preda and Selva ceramic urinals with attractive new partition walls, all designed at the studios of Christoph Behling Design in London, UK. Geberit is constantly adding sustainable innovations to its product portfolio each year, and 2016 is no exception, says a company spokesman. Commenting on the latest products, the spokesman says the signature feature of the new Geberit urinal systems is their flexibility. “A suitable solution is available for virtually any requirement and any construction task with planning, installation and maintenance of urinal systems greatly simplified,” he says. The system’s integrated urinal flush control is claimed to be a world first with the flush control located in an easily accessible point underneath the ceramic appliance. You do not have to remove the ceramic for service and maintenance. The new systems will be available in the Gulf from this month (April). Geberit concealed cisterns and flushing systems are distinguished by their extreme reliability and durability, thanks in part to Geberit’s experience and 25 years of guaranteed spare parts availability that make them our best-selling product, he points out. The company has 52 years’ experience with concealed cisterns. Geberit has also introduced new flush actuation plates and a brand new sand colour to the Monolith family. “Not only is the colour new, the installation has been simplified as well,” the spokesman says. In ceramics, it has new Rimfree WC and bidet designs. These units feature available attractive WC seats with slim sandwich or overlapping options. In the premium range, the company offers the new Citterio Rimfree WC, which is described as being easy to clean and environment-friendly. In addition, Geberit has expanded its piping systems with more than 50 new articles. Geberit products have been supplied to several developments in the UAE. Some of the latest projects include The Address Residence Sky View in Downtown Dubai, Hard Rock Hotel in Marina 101, Al Fattan Crystal Towers – Rixos, Jumeirah Al Naseem Hotel and Dubai Opera House, all in Dubai; and Khalifa University expansion project in Abu Dhabi. Established in 1874 and headquartered in Rapperswil-Jona, Switzerland, Geberit Group is a European leader in the field of sanitary products. It operates as an integrated group with a strong local presence in most European countries, providing a unique added value when it comes to sanitary technology and bathroom ceramics. Geberit’s production network encompasses 35 production facilities, of which six are located overseas.